The High Country News tribal affairs desk is going through a transformation. We recently hired Tristan Ahtone to head our coverage of Indian Country, and he joins myself and Assistant Editor Anna V. Smith, as well as several contributing editors and reporters stationed across the West. And while Indian Country News will continue, its focus will change; instead of weekly analysis of current events, we’ll provide a range of topics from updates on what we’re reading to perspectives from around Indian Country. We’re making this move to focus on building what has officially become the first stand-alone desk in the magazine’s nearly half-a-century of existence. That way we can bring you more of the thoughtful, on-the-ground reporting that has long been a cornerstone of HCN’s insightful coverage of the people, politics and places of the West. Over the last several months, we’ve used the Indian Country News installments as a way to discuss current events through the lens of the Indigenous experience. A few of my favorites have been our look at marriage equality and tribal nations, how the #Metoo movement and Missing and Murdered Indigenous Women movements intersected, and the dizzying ways race is employed in HBO’s Westworld. 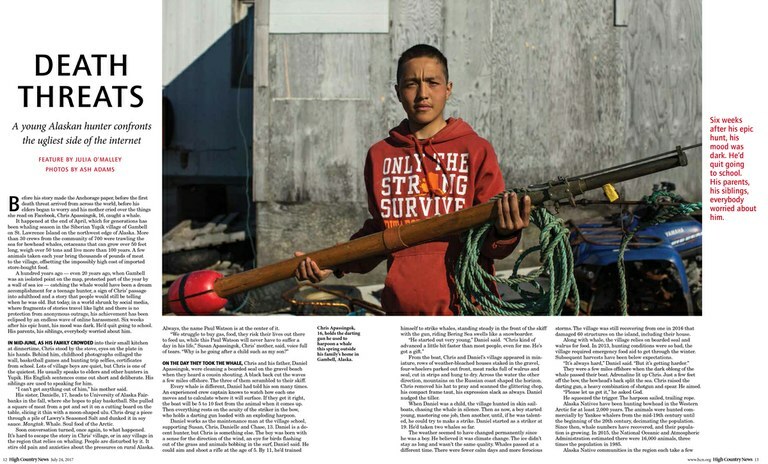 One of High Country News' early tribal affairs desk features about an Alaskan Native teenage whaler, by writer Julia O'Malley and photographer Ash Adams. Instead, we will bring you more in-depth pieces like Julia O’Malley’s story about Chris Apassingok, a teenager whose first successful whale hunt brought food, pride and death threats from environmentalists around the world. Stories like Anna V. Smith’s on the persistence of sexual harassment in the Bureau of Indian Affairs, Paige Blankenbuehler’s investigation into GoFundMe money raised for Standing Rock and where it went, or this week’s story from the desk, Matthew Fletcher’s analysis on how Indian Country will remember Supreme Court Justice Anthony Kennedy. We’re also continuing to expand our network of freelancers in Indian Country. We’re on the hunt for certain kinds of stories, and you can find that list, as well as helpful guidelines here. We also want to connect readers not only with us, but also with each other, so tell us what’s happening in your community so we can let others know. Thanks to all of you who have been following along as the tribal affairs desk grows. Your support keeps us going, and we hope you’ll stay with us as we dive deeper into Indigenous issues and illuminate the stories that make us who we are. As we progress on more in-depth reporting, we’ll continue to bring you the weekly ICN newsletter in the form of commentary on our reporting and process, as well as a look at what we’re reading from around Indian Country.